Située à moins d’un pâté de maisons de la plage et de la jetée de Johnnie Mercer, cette maison de ville de 3 chambres, 3 salles de bain comprend une cuisine, un coin repas / salon qui s'ouvre sur une grande terrasse avec vue sur l'océan. Il y a aussi 1 chambre et salle de bain à ce niveau. A l'étage a le maître avec salle de bain qui s'ouvre sur le pont privé, ainsi que la chambre et le bain invités. The Loop, un sentier pavé de 5 km autour de Harbour Island et du centre-ville de Wrightsville Beach, est accessible pratiquement à votre porte pour un jogging matinal! Douche extérieure Parking pour 3 voitures dans abri voiture et allée. Occupation: 8. Interdiction de fumer. Pas d'animaux de compagnie. We had a great time. The place is gorgeous, and really clean. There's a lot of room for board games, relaxing, cooking, and sleeping. So close to the beach, we just walked right over and were there. Also close to the pier. Perfect for family of 8! Nice spacious townhouse with three full bathrooms. Great to see that the homeowner has tried to keep things fresh and updated. There were however too many personal photos in the home, but all and all a great rental and location. We would definitely consider renting again. Stayed for 4 nights for UNCW graduation - perfect location - short walk to beach - not too far from beach bars! Really liked the fact the parking holds 3 cars. 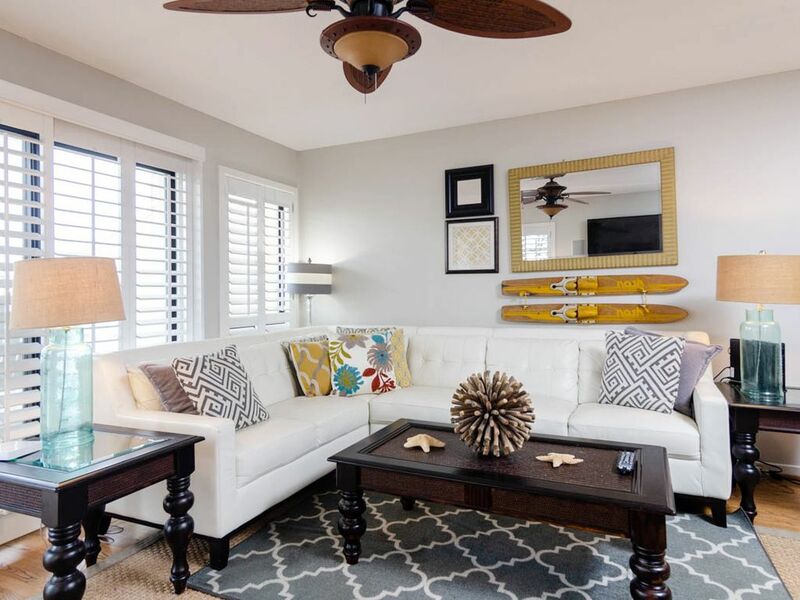 Home is very comfortable and rooms are decorated fun, beachy feel! I would definitely stay here again. Check in and check out was super easy, Bryant realty is just across the street! McGraw was in the perfect location (short walk) for our annual fishing trip at Johnnie Mercer Pier in memory of my Dad. This unit was clean and beachy. It was the first time we've stayed in one with personal pictures everywhere though. Lol The icemaker and water dispenser on the refrigerator were not operational but everything else was good. My daughter left her makeup bag there and when we called to see if it was found it had been. Very nice and friendly staff at Bryant. Overall great place to stay! We paid for 4 days and were told to leave after 2 days because of Hurricane Matthew. Returned extra linens I had purchased unopened and expected a refund for these linens. Hi Mary- thank you for your feedback! While we are sorry that the weather was unpleasant for your stay, there was no mandatory evacuation during the hurricane. We were fortunate enough that we did not have to evacuate any of our guests, nor ask them to leave. We hope the rest of your year was lovely!